A Leatherback turtle was fighting for his life caught in a shark net off Newport Beach last Sunday, March 10th. Luckily Newport Lifeguards Nigel, Lauren and Frank were on the scene. The Australian Seabird Rescue Central Coast received a call from Tracey and Jess from Newport Lifeguard Station asking for help and that the guys were trying to cut him free. Chances are with these injuries he will come to shore. If you do spot him, please do not approach him as that will cause distress. Telephone the numbers above and stay at a safe distance to watch him until someone arrives. Sea turtles are air breathing reptiles that have lungs, so they regularly surface to breathe. Sea turtles spend a majority of their time underwater, so they must be able to hold their breath for long periods. Dive duration largely depends on activity. A foraging turtle may typically spend 5–40 minutes under water while a sleeping sea turtle can remain under water for 4–7 hours. Remarkably, sea turtle respiration remains aerobic for the vast majority of voluntary dive time. When a sea turtle is forcibly submerged (e.g. entangled in a trawl net) its diving endurance is substantially reduced, so it is more susceptible to drowning. When surfacing to breathe, a sea turtle can quickly refill its lungs with a single explosive exhalation and rapid inhalation. Their large lungs permit rapid exchange of oxygen and avoid trapping gases during deep dives. 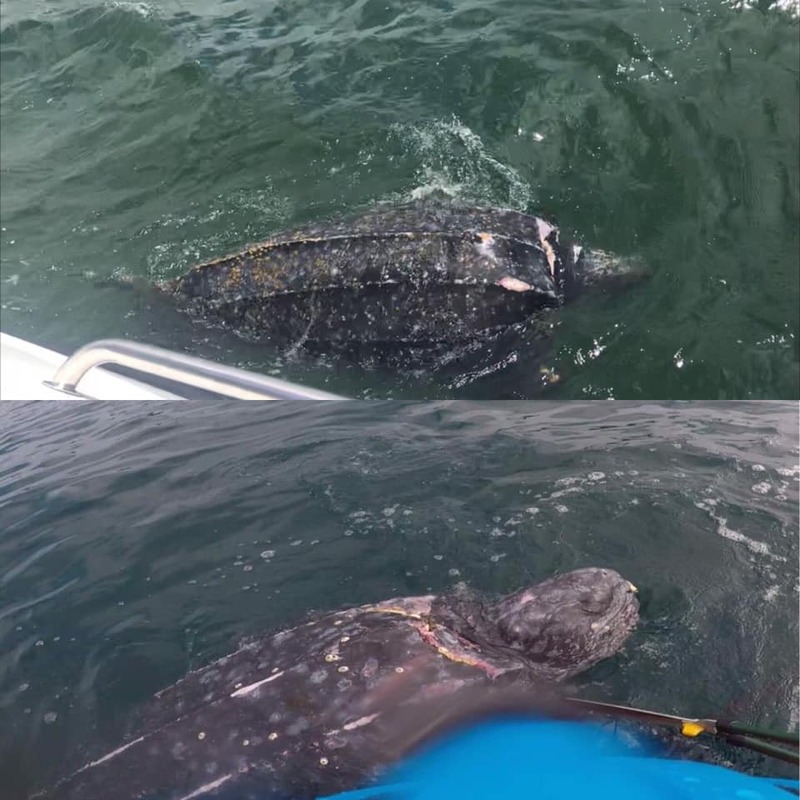 Cheyne (ASRCC) took the photo above of a Leatherback at the end of January (top photo) and the bottom pic is the photo Nigel took of the Leatherback caught in the shark net at Newport Beach last Sunday. Looks like the same injuries which Cheyne thought were probably from boat strike when he saw the turtle initially. He is certainly getting worse and in needing of rescuing. He’s a huge turtle and needs proper gear to catch and transport. Please keep an eye out for him and let's get him healed and back into his salty home. Video from Nigel taken on Sunday freeing the Leatherback from the shark net: great work Newport SLSC! It all kicked off over the Lifesaving Championships weekend. The club fielded strong teams in the Champion Lifesaver and the Patrol Competition where they secured top three places in six of the 13 events. The following weekend they continued to display their competence in the core lifesaving arena taking out gold and silver in the Under 19 First Aid Competition as well as third in the Under 15 and Open divisions. These results proved valuable as the overall pointscore begun to accumulate the following weekend. It showcased the breadth of the Newport team across all areas of competition. Newport caps were heavily represented in each division from Under 15s through to Opens as you looked out across Swansea Belmont’s Blacksmiths Beach. The team was ignited by the energetic efforts of the young water squad. “The boys won and filled the placings in every race in their division,” said Carroll. “Kimberley Doyle’s emphatic Under 15 Ironwoman win on finals day gave everyone something to cheer about. With a grin to match his wins, Mitchell Trim was racing in memory of fellow competitor and friend Alana de Kort of Collaroy SLSC, who tragically lost her battle with cancer in 2018. Trim carried Alana with him through his wins in Open Single Ski, Ski Relay, Double Ski, Lifesaver Relay and Mixed Double Ski on Sunday. “These conditions are like a kayaking regatta it's a bit like being back at Umina Beach. You've got to be on the whole way, but it's pretty fun out there. The NSW Interstate captain also showed that he was a little worried about maintaining his place in the Opens team with the success of the up and coming young guns. World's Greatest Shave 2019: Mo, Fro And Lanky Locks GO! Over 20k Raised!! Brian Friend OAM, Seb Brown and Douglas Dalziel - the before photo! On Friday Newport teenager Sebastian Brown and Brian Friend (Friendly) plunged into losing a little hair for a great cause. Seb said he decided to be part of this year's World's Greatest Shave for the kids who experience leukaemia, 'but also for their families, this impacts on them too. In fact (I'm doing this) for all people affected by cancer." "It's just cutting your hair off - it's not going to matter much in 20 years time." Friendly may have had a different perspective - his 'mo' has been a part of his life for well over two score and something years...while Doug has been cultivating that halo of hair for a while too and may require a beanie in his period of hairless adjustment. They all went ahead and came out grinning, laughing - their fan bases stoked with what they have done. Between them they have met the fundraising targets they set and then some - Friendly exceeding his goal line by almost three times what he thought people may chip in. Not only that, his wonderful wife Robyn and Team Friendly found 20 sponsors in the neighbourhood who put up great prizes for a raffle and when he was looking like he may be getting close to losing that Mo the 'Flower' as Friendly calls her started spruiking kisses for 20 cents! All the professional surfing action will kicked off in Manly on Saturday with the opening day of the Vissla Sydney Surf Pro. The 2019 Key Sun Zinke Sydney Pro Junior will occupy the opening weekend, while the QS6000 divisions will run from 18th – 24th March 2019. The event was officially opened today by Surfing NSW CEO Luke Madden, Northern Beaches Council Mayor Michael Regan, professional surfers Shane Campbell, Connor O'Leary, Cooper Chapman, Member for Manly James Griffin and WSL Australia/Oceania Regional Tour Manager Will Hayden-Smith. 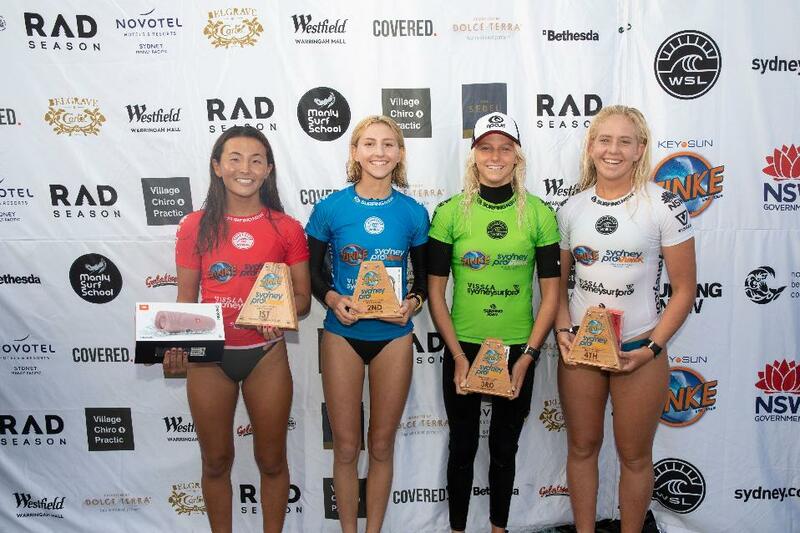 Alister Reginato (Sunshine Coast, Qld) and Keala Tomoda-Bannert (Hawaii) have taken out the 2019 Key Sun Zinke Sydney Pro Junior following an exciting day of surfing in throaty three-to-four foot beachbreak conditions in Manly. Northern Beaches native Cedar Leigh-Jones (Avalon, NSW) claimed the best result of her junior career, finishing in second position. The natural-footer performed an eclectic mix of turns and snaps to put on a valiant fight which she maintained until the dying moments of the final, however when the final hooter sounded Leigh-Jones had to settle for the runner-up position with a 13.70 two-wave total. Queenscliff Boardriders Club and North Steyne Boardriders took one win apiece across the Rad Season Boardrider Club Trials, with Alysse Cooper (QBC) taking out the women’s division convincingly, while George Pittar (North Steyne) fought a tight battle with Sam Page (QBC), Blake Levett (North Steyne) and Gerard McCallum (QBC) to earn the Men’s wildcard. North Narrabeen Sports High claimed a clean-sweep of victories across the Boys and Girls divisions of the Lifeline High School Challenge. Both divisions posted a series of giant scores in the 45-minute tag-team heats to claim the wins convincingly. The QS6000 divisions will run from 18th – 24th March 2019! When the emergency department at Mona Vale Hospital closed last October, many in the community were worried about the extra half hour drive from Pittwater to reach the shiny new Northern Beaches Hospital. The frequency of Wakehurst Parkway flooding – the most direct route to the hospital – and its closure during bushfires did nothing to soothe the nerves of locals. Neither did awareness of statistics from the emergency department at Mona Vale. In 2017-18, 182 patients were resuscitated on arrival; another 4,850 needed treatment within 10 minutes; and 12,398 within half an hour. With drownings and injuries at local beaches, accidents at skateparks and in school holidays, and illnesses amongst community elders, residents were worried that the extra travel to the new hospital would mean many would not make it in time or outcomes would be less successful. The situation was only exacerbated by the serious shortage of paramedics across NSW, with waits of an hour and a half for an ambulance in Pittwater not unknown. The dysfunction that occurred at the privately-operated Northern Beaches Hospital on opening as a replacement for acute services at the public Mona Vale and Manly Hospitals has been well-documented, along with NSW Premier Gladys Berejiklian and Health Minister Brad Hazzard’s response that they were just “teething problems”. Pittwater MP Rob Stokes, despite many appeals from the public and protests, has continued to rule out re-opening full acute services at Mona Vale. On Saturday Pittwater community residents staged an election eve protest, calling for emergency, surgery, maternity and other acute services to be reopened at Mona Vale and the problems at the new “hospital on the hill” to be resolved. Residents relayed more hospital horror stories at the rally in Mona Vale Village Park, led by Save Mona Vale Hospital chairman Parry Thomas. Mr Thomas told the crowd the story of a woman who recently had a heart attack in Avalon, and after waiting for an ambulance to come from Balgowlah was taken to Northern Beaches Hospital at Frenchs Forest. There she was placed in a ward but staff failed to keep records, failed to keep her on a drip despite being “nil by mouth” for over 24 hours as she waited for surgery, failed to monitor her condition and failed to respond to her urgent calls for help. During administration of a drug after her blood pressure escalated dangerously - that had potentially deadly side effects - no cardiologist was available so a pharmacist ended up supervising her treatment. He was forced to pull up a nurse for attempting to start the treatment without wearing gloves and later for dispensing a dangerously high dose and failing to measure the patients’ vital signs regularly, at five minute intervals. After a second heart attack, a terrified wait and multiple requests while her regular cardiologist was standing by for her at The San, she was eventually transferred there 24 hours later. The only record of the woman’s treatment was on scraps of paper that a nurse pulled out of her back pocket to hand to the paramedics who transported her to The San. “The ambulance people asked for her records and they were non-existent,” Mr Thomas said. “And when she got up to The San the staff, handed these pieces of papers, said: ‘What do we do with this? We’ve just got to start all over again. On November 30th 2018 around 15 thousand students forwent a day at school preparing for their future in order to state that they needed to know they would have a future to prepare for. On Friday March 15th 2019 150 thousand Australian students, Pittwaterians among them, again forwent a day at school, preparing for their future, in order to state that the time to step up and ensure they have a future is now well overdue - by decades in fact. The Australian school strike movement began when school students in Central Victoria were inspired by now 16 year old Nobel Peace Prize nominee Swedish student Greta Thunberg who has been striking outside Swedish Parliament every Friday since August. 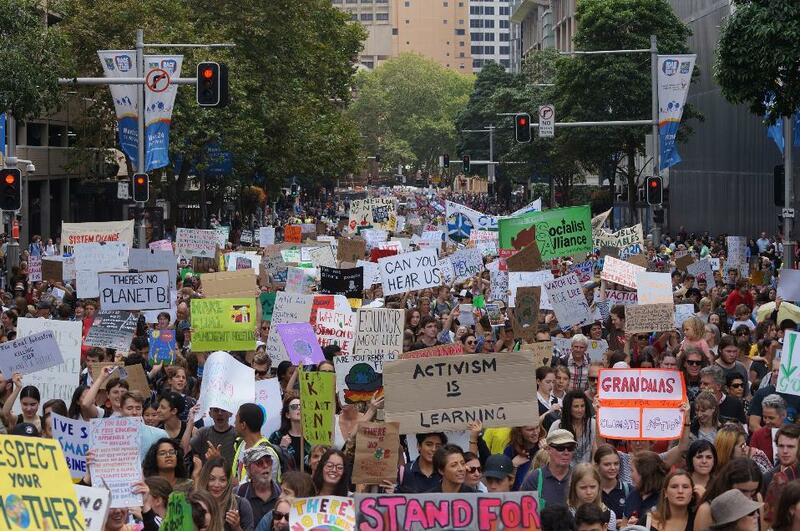 16 year old Nosrat Fareha from Western Sydney said, “The turn out across Australia was nothing short of amazing. “Politicians have responded with indifference to our crippling summer of record heat, bushfires and floods. It’s no wonder so many came out in support today. “With the federal election around the corner, our political leaders must commit to stop the Adani coal mine, say no to new coal and gas projects and transition to 100% renewable energy by 2030. “There’s no time to stand by and wait for the bold action we need. We will keep organising, building our movement and riding the wave of community frustration until Scott Morrison and Bill Shorten step up to the job.” concluded Fareha. 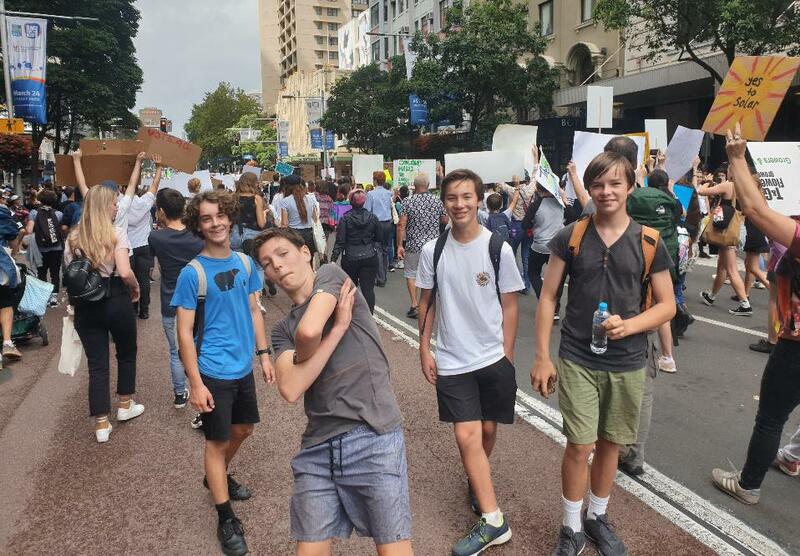 Harley Ratcliff and his year 8 mates at the Strike - photo by Lisa Ratcliff. Cassia (Senna pendula). Also known as Senna and Arsenic Bush. 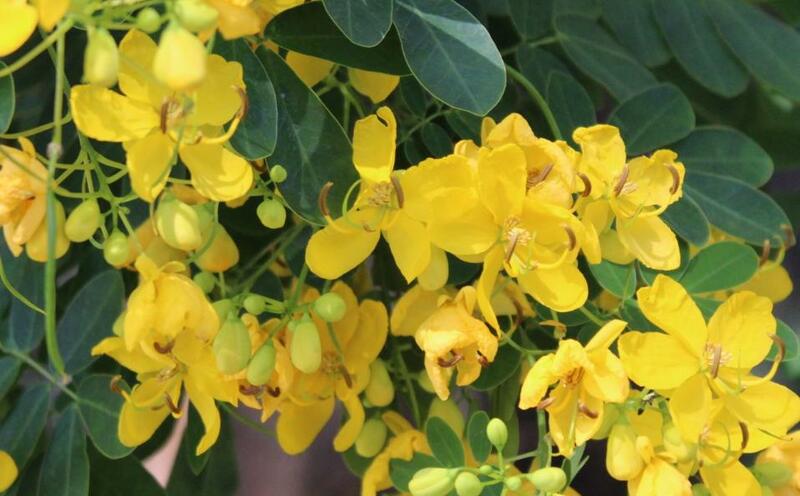 Originating in South American, Cassia is a perennial sprawling multi-stemmed shrub or tree up to 5m tall. This weed replaces native vegetation and establishes in a wide range of native plant communities, including coastal heath and scrubland, hinddunes and riparian corridors. The large seed pods are eaten by birds and other animals. Currently flowering - please pull out and get rid of if you have in your garden or join a local Bushcare Group to help Pittwater rid itself of this weed. Currawong from Pacific Road, Palm Beach backyard - Monday March 11th.